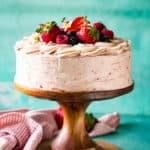 Rich yellow cake striped with sweet berry cake and layered with a deliciously sweet berry frosting. Preheat oven to 350 degrees. Grease and flour two 8-inch round cake pans. In the bowl of your mixer, cream together the butter and sugar until light and fluffy, about 5 minutes. Run the mixer or beaters for an additional 3-4 minutes or until the batter becomes pale and light. Gradually add in the flour mixture alternately with the milk, mixing just until incorporated. In a medium-sized microwave save bowl, heat jam for 20 seconds or until warm, but not hot. Stir the buttermilk and sugar to the warm jam. Stir in 2 cups of the cake batter into the jam mixture, mixing only until just combined. To make the zebra stripes, scoop a small amount of the yellow cake batter into the center of the pan and then alternate with a scoop of the berry cake batter directly on top of the first. Continue adding yellow cake batter and berry batter on top of each layer until you have used half of both batters; repeat with second pan. As the batter sets, it will spread to the edges of the pans. Bake cakes 25 to 30 minutes, or until a toothpick inserted into the middle of the cake comes out clean. Let the cake cool in the pans for 15 minutes, then remove from the pans and place on a wire rack to finish cooling. Beat butter, vanilla, and jam until creamy and smooth. Add 3 cups of powdered sugar and mix on low until combined. Add an additional 3 cups of powdered sugar and mix until combined. Once combined, increase mixer speed to medium high and beat until frosting is light and airy. If needed, add an additional cup of powdered sugar. To assemble the cake, place one cake layer on the cake plate. Spread a thin layer of frosting over the layer. Spread 1/2 cup of berry jam over the frosting, then top with 2nd cake layer. Frost the top and outside of the cake. If you have remaining frosting, pipe rosettes on the top using a 2D tip.